If you missed out on part one, here's the link: The Ellison's and Bryants --Part one. So was Caroline Ellison, my 3rd great grandmother, a slave or was she a free person of color? Ancestry.com's North Carolina Marriage Collections, 1741--2004, on line database gave me my first indication of what her status was. Now when I found this online, I wasn't satisfied with just this. I wanted to see if there was an original document somewhere that had information regarding their union. I wrote to the North Carolina State Archives and made a request of a photo copy of their marriage document. The very last entry on page 128, shows my 3rd great grandparents listed as Henry Bryan and Caroline Bryan. The date of the commencement of their cohabitation was July 31, 1864. The date of acknowledgement was May 5, 1866. Until I had made this request, I hadn't known that former slaves were allowed to register their marriages, to allow for some legitimacy of their unions. Caroline and Henry were both ex-slaves who registered their marriage when they had the opportunity. But why did they come to Morehead City? My theory regarding this I will discuss in my next post. How wonderful that you have this documentation of your ancestors union. My great grandfather was asked in his USCT pension record if any record existed of his marriage to his wife. His response "No for we married just as Negros married". Thanks Sandra! Now that is truly a statement by your great grandfather that shows how dehumanizing slavery actually was. Thank you for sharing. 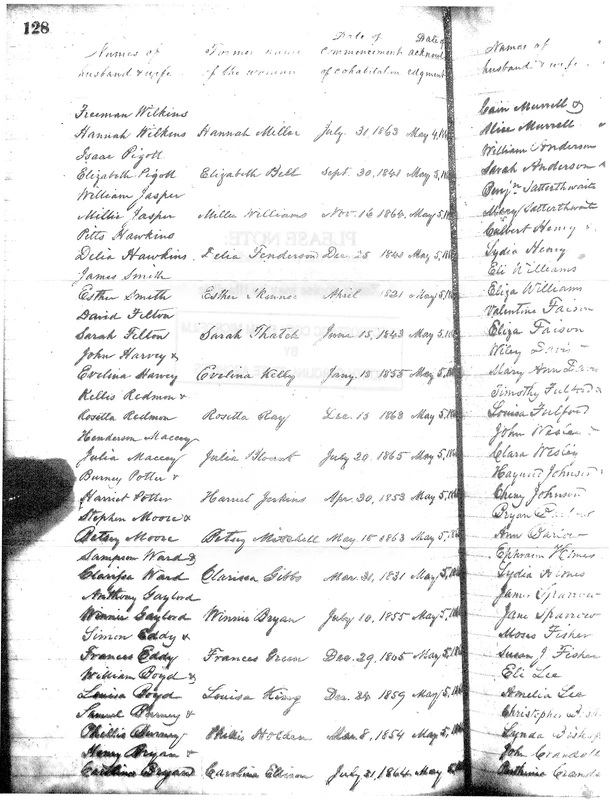 I have found several records of ancestors who were married in 1866. For others I have found no record. I don't know if no record exists or if they came together before the war and considered themselves married enough. They stayed together and raised large families and their children went on with the education and skills that their parents made sure they received. I know that slavery tried to dehumanize us but, I'm not sure that lack of a record for couples that pulled together through thick and thin is an example of the success of that attempt. The more I think about it the more I think the it's an example of the humans that we remained in spite of everything.